A few weeks ago my big sister turned 30 and as a present I wanted to organise a special day out for us both. Danielle loves afternoon tea, but she’s done most of the fancy ones – Claridges, The Ritz, etc. – so I started to look for something similar, but a bit different. 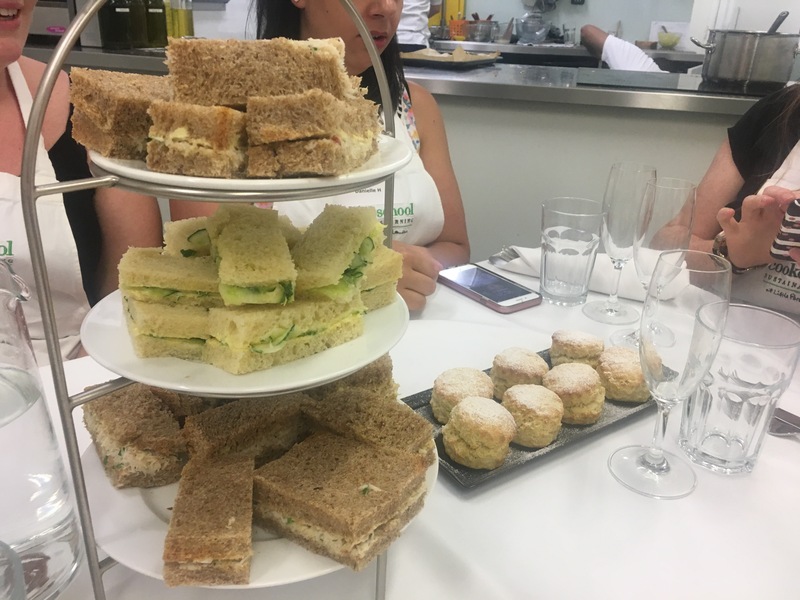 I came across an afternoon tea cookery class at The Cookery School on Little Portland Street and thought it would be perfect. The reviews were all really positive and it would be fun to do an activity as part of our day out (if you’re interested we also went for cocktails and to the theatre!). The class ran from 2-5 on Saturday. We arrived a bit early and were introduced to our teacher Khalid, a professional pastry chef originally from Morocco. He chatted away to us for a bit, and we were offered a glass of wine. 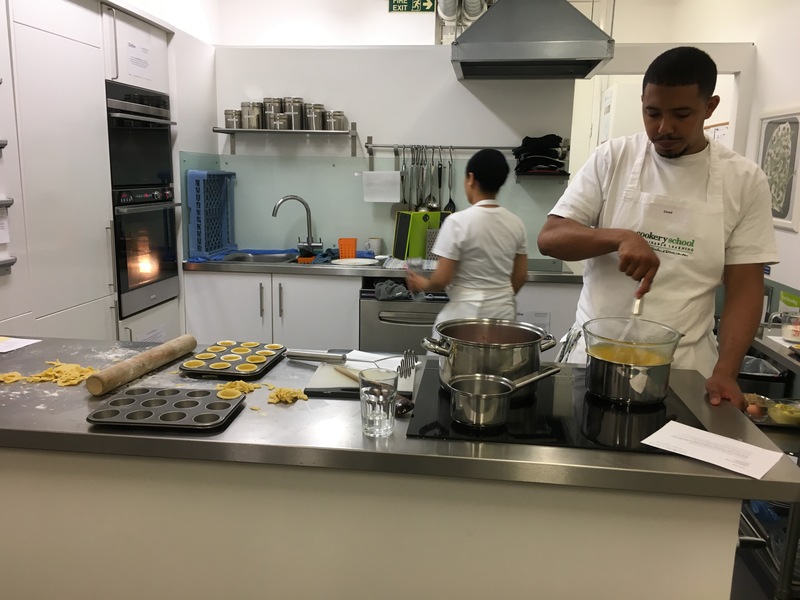 There were also two others in the kitchen who were there to help him out – Imad, who helped me lots, and another lady. Once everyone else had arrived (an American family with two daughters, a group of 3 friends and one posh lady who had a Gucci handbag and asked questions about how to use her Kitchen Aid… bloody hell do I want a Kitchen Aid!) we put our aprons on and got started. 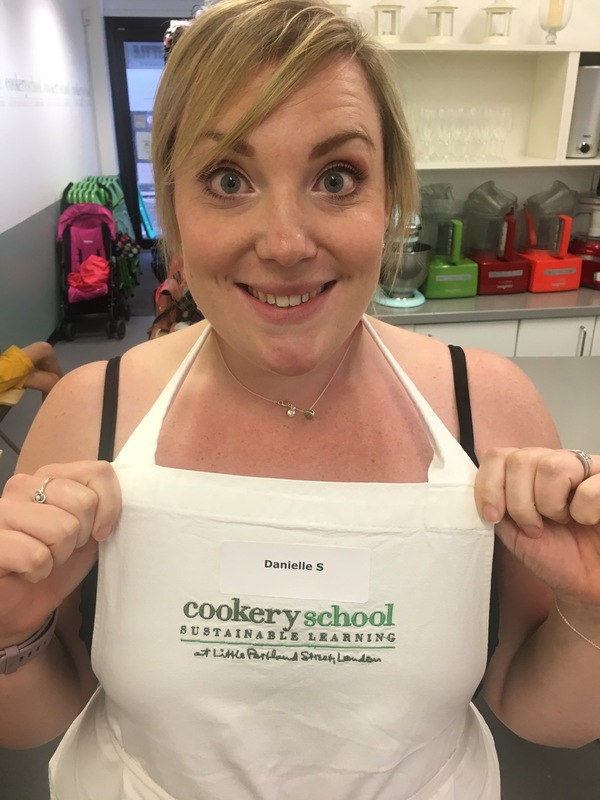 Ready to go in our aprons! The class structure was absolutely brilliant. 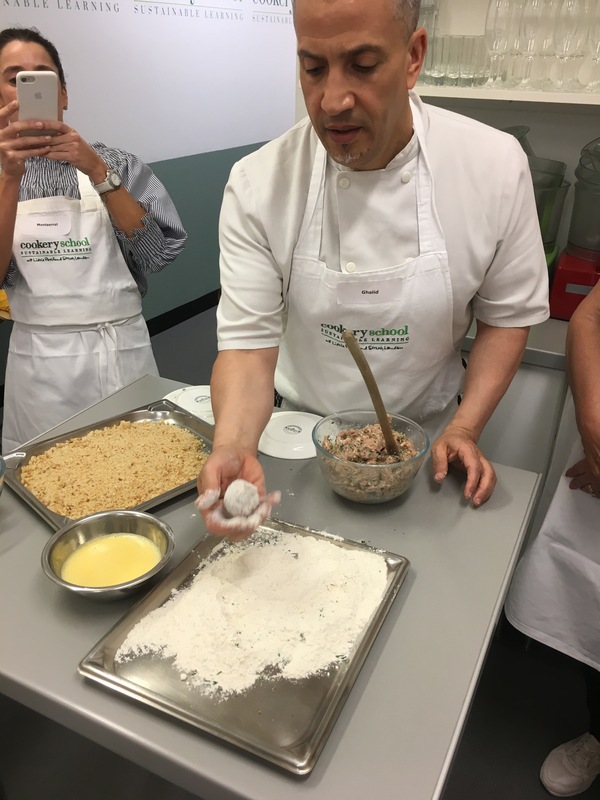 We were shown by Khalid how to make shortcrust pastry and bread first. He did this at the front of the class and asked us questions about what we should add and when/why. He was very funny with quite a dry humour. When someone murmured an answer they weren’t quite sure about he very flamboyantly told us “Convince me!! Believe in yourself!”. After this it was all stations go. We were in groups of two or so. 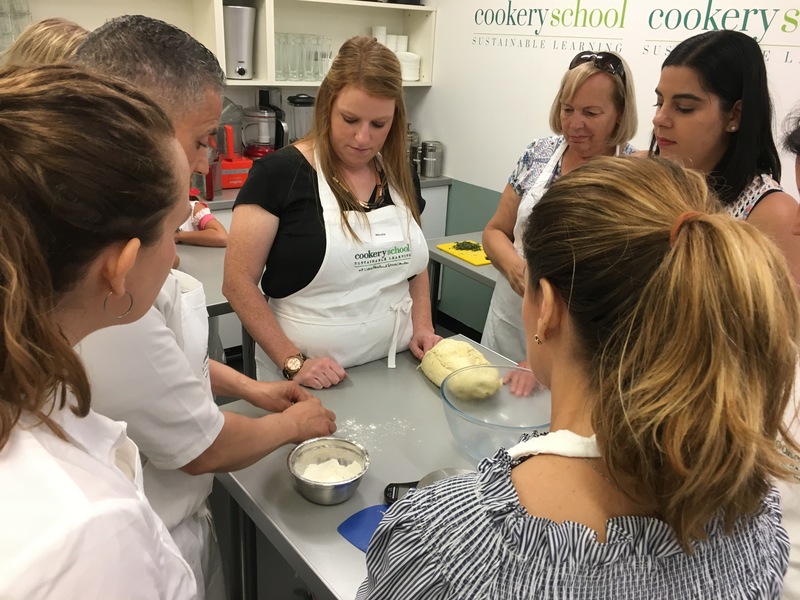 Some of us were in charge of cutting the pastry and making tart cases, some people starting making rolls, lemon curd, sandwich fillings. I was in charge of making jam so I was given the recipe and started chopping away at the strawberries. He swapped us round constantly, and if there was something you needed help with he or one of his two helpers would be straight there. Every so often he’d call everyone over to watch a certain technique or to taste something. You were always working with different people on different things and it was so enjoyable. Making jam and lemon curd! 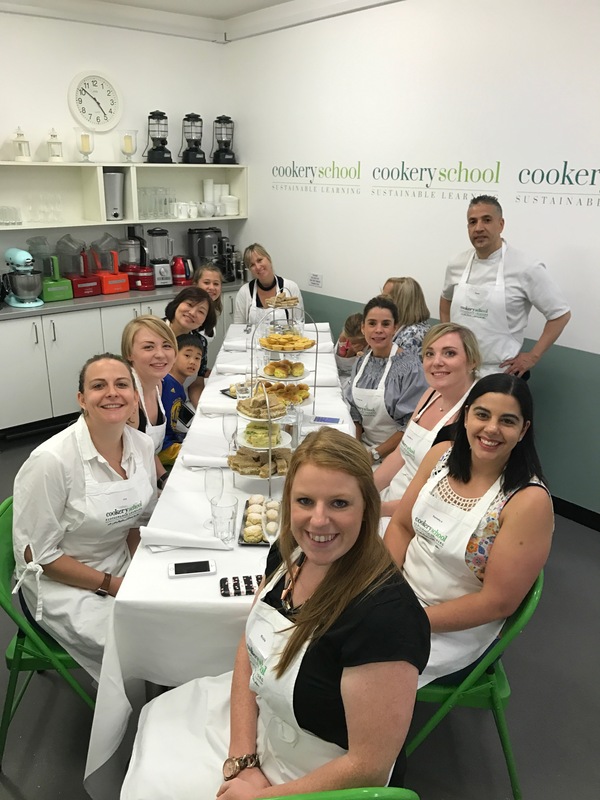 During the class we made lemon tarts with homemade lemon curd, a sponge cake with a cream centre and chocolate ganache top, savoury cheese scones, regular scones with homemade jam, mini scotch eggs with quails eggs, and three types of sandwiches (cucumber, egg and crab) each with homemade bread! At the end of the class we all sat down on a long table with a glass of champagne to eat our slaved over afternoon tea. We were so excited to taste everything and it was absolutely delicious! 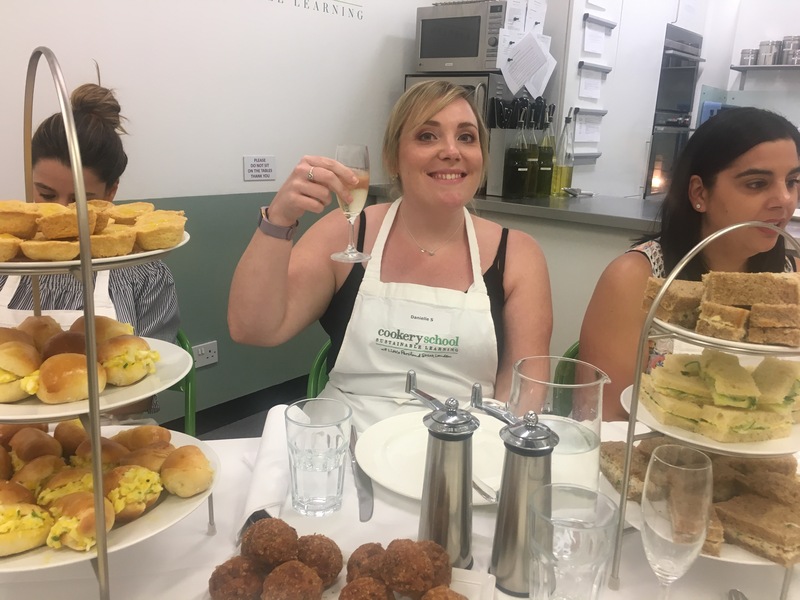 It felt like a real achievement that we’d made everything we were eating – and I will definitely appreciate all the hard work that goes into an afternoon tea a bit more next time I have one! It was a brilliant gift (I hope) and a fun way to spend an afternoon. I’d definitely recommend it, especially with friends or family. 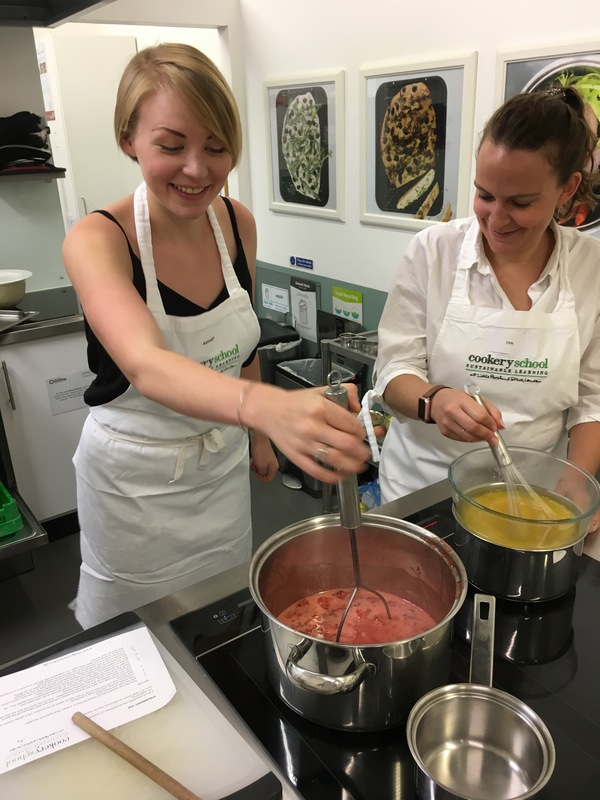 You also get the recipes sent to you in an email after the class (although I’m not sure I could recreate it all at home without the 10+ people around me!!). You can book in to this class, or any of the others they offer, via their website. After the class I mentioned my blog and they’ve very kindly offered a discount code to you lovely lot. If you use ASHLEIGHFERRIS-10 at the checkout you’ll get 10% off until the end of July! Sunday roast class, anyone?